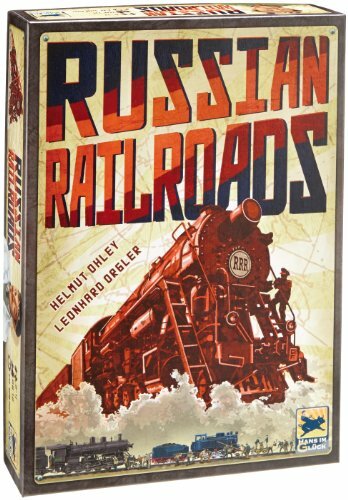 In Russian Railroads , players compete in an exciting race to build the largest and most advanced railway network. In order to do so, the players appoint their workers to various important tasks. The development of simple tracks will quickly bring the players to important places, while the modernization of their railway network will improve the efficiency of their machinery. Newer locomotives cover greater distances and factories churn out improved technology. Engineers, when used effectively, can be the extra boost that an empire needs to race past the competition. There are many paths to victory: Who will ride into the future full steam ahead and who will be run off the rails? Whose empire will overcome the challenges ahead and emerge victorious? The Aliens are coming! The X Deck is a not-entirely-serious expansion for Uwe Rosenberg's Agricola, to be released through Spielbox magazine in German and through Lookout Games in English. The October 15, 2008, issue of Spielbox magazine includes a standalone add-on deck (in German) for Agricola that’s been dubbed the “X-deck.” The deck includes 24 cards of 5 different types (Alien Actions, Merchants from Outer Space, Alien Artifacts, Alien Events, and Alien Occupations). Art for this expansion is by Klemens Franz, the same artist who did the work for Agricola. The aliens arrive when the players create a Quarry; that is, when the "1 Stone" card from Stage II of the game (Rounds 5-7) is revealed. Whenever a player takes this action, they also draw the top card from the Alien Encounter Deck (X Deck). (Note that this does not apply to the "1 Stone" card that appears during Stage IV (Rounds 10-11).) Of course, you also take any Stone that is on the space. 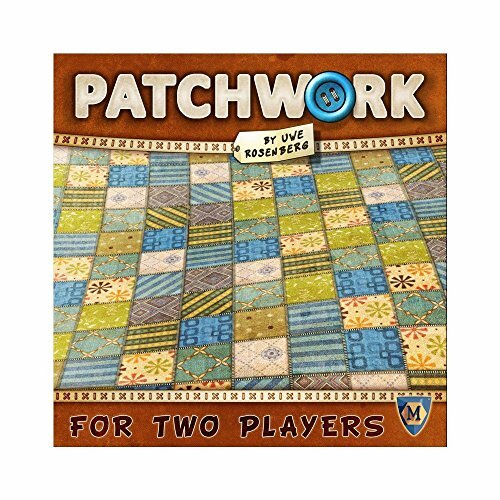 An English edition of this expansion has been available directly from Lookout Games and can be obtained by donating to a fundraiser via PayPal. It is also available via Agricola: The Goodies Expansion . The Agricola Z-Deck is a 24-card Promo Deck for Agricola. It was developed in 2007 by Uwe Rosenberg, Hanno Girke, Melissa Rogerson, and Klemens Franz as a bonus for the first printing of Z-Man games English edition of Agricola, but was also released in other languages. Later Z-Man editions do not contain the Z-Deck. It comprises 12 Occupation and 12 Minor Improvement cards. A 24 card expansion to Agricola (12 Minor Improvements, 12 Occupations) published Sept/Oct 2009. CZ relates to the Czech Republic - this expansion is based on Czech lore and history. It was developed by MIND OK and Uwe Rosenberg and was originally available in Czech and German. But now in English as well. The artwork was done by Klemens Franz in the style of the famous Czech author and artist Josef Lada. The " Ö-Deck " brings 24 new cards for Agricola. Theme of this expansion is Austria ( Österreich , that's why it is called Ö-Deck). Visitors of the gameplay festival in Vienna 2008 were able to get one copy of only 3000 printed in German. The cards were later also printed in English (quantities unknown). The Ö-Deck brings 12 new occupation cards and 12 new minor improvement cards. Terraforming Mars: Spielbox 2/17 Promo Was also available as a reward for backing The Secret Cabal Gaming Podcast Kickstarter 2017 Campaign and the Man vs Meeple Kickstarter 2018 Campaign. Automated Card Needs two oceans. Increase plant production and heat production one step. German text: Schneealgen Selbstständige Karte (grün) Benötigt 2 Ozeane. Erhöhe deine Pflanzen-Produktion und deine Wärme-Produktion um je 1. "Durch das Eis geschützt erzeugen sie eine innere Mikro-Umgebung, die den Schnee verfärbt." The card game Nox features ninety cards, thirty each in orange, green and blue. Each player starts each round of play with three cards in hand. On a turn, a player either: Plays one card in front of herself or another player to expand that player's kitty, or Plays that card on top of a matching-colored card in any player's kitty. Any time that a player has two stacks topped with a card of the same number, those stacks are merged into a single stack. After playing, the player draws one card from the deck. As soon as one player has six separate stacks in front of herself or all players have no cards left in hand, the round ends. Any player without stacks topped by cards of all three colors scores zero points for the round; all other players sum the numbers shown on the uppermost card of each stack they have. Rounds continue until at least one player has scored at least 150 points. In this case, the game ends and the player with the most points wins. For a harsh variant, players can decide that only the player with the most points each round scores, while everyone else receives zero points. In this variant, the game ends once a player reaches 100 points. A pattern recognition game. There are 15 large, sturdy cards depicting an array of various objects such as kites, balls, pencils, fish, etc. Each card shows the same 15 objects, but the objects are all different colors and are in different locations. Any two cards always have one and only one object that is identical. Be the first to find this object! In Carcassonne Big Box, players will find the basic game and nine expansions. This box is the gaming passport for Carcassonne fans old and new. The expansions can all be combined. Each of them is identified with a specific icon, making it easy to create the combinations you want to play, when you want to play them. Carcassonne Big Box, a universe to discover! Carcassonne is a tile-placement game in which the players draw and place a tile with a piece of southern French landscape on it. The tile might feature a city, a road, a cloister, grassland or some combination thereof, and it must be placed adjacent to tiles that have already been played, in such a way that cities are connected to cities, roads to roads, etcetera. Having placed a tile, the player can then decide to place one of his meeples on one of the areas on it: on the city as a knight, on the road as a robber, on a cloister as a monk, or on the grass as a farmer. When that area is complete, that meeple scores points for its owner. This mini-expansion for Carcassonne comprises 10 tiles marked with a 10th anniversary icon. When placed, the tiles allow a player to place a follower as normal, or return a follower currently on the board back to their supply. 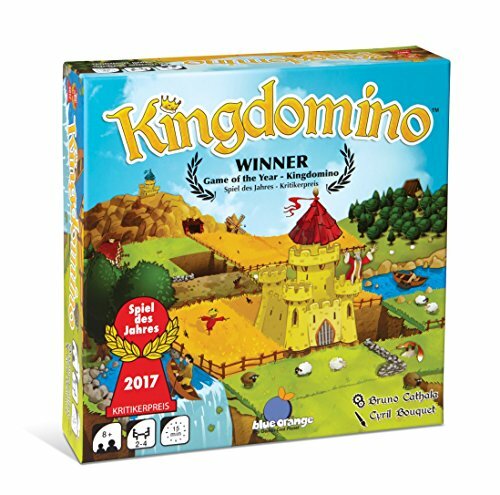 This expansion was originally packaged with Carcassonne: 10 Year Special Edition, but was also sold separately by some retailers. Part of the Carcassonne series of games. In Ohne Furcht und Adel , players take on new roles each round to represent characters they hire in order to help them acquire gold and erect buildings. The game ends at the close of a round in which a player erects her eighth building. Players then tally their points, and the player with the highest score wins. Players start with a number of building cards in their hand; buildings come in five colors, with the purple buildings typically having a special ability and the other colored buildings providing a benefit when you play particular characters. At the start of each round, each player secretly chooses one of the eight characters. Each character has a special ability, and the usefulness of any character depends upon your situation, and that of your opponents. The characters then carry out their actions in numerical order: the assassin eliminating another character for the round, the thief stealing all gold from another character, the wizard swapping building cards with another player, the warlord optionally destroys a building in play, and so on. On a turn, a player can either earn gold or draw two building cards and discard one, then optionally construct one building (or up to three if playing the architect this round). Erecting buildings costs gold. At the end of the game, each building is worth a certain number of points. In addition to points from buildings, at the end of the game a player scores bonus points for having eight buildings or buildings of all five colors. The 2012 release of Ohne Furcht und Adel includes fifteen cards not included in the original base game, with seven different types of action cards. These cards are mixed into the building card deck, and one action can be played each turn. Action cards in hand are worth one point at the end of the game. The cards, their actions and their counts are: (x2) Wahrsagerin (Fortune Teller) – Look at an opponent's hand and take one of their cards. (x2) Direktor (Director) – Build up to two more buildings this turn. (x2) Rasputin – Negate an assassination. (x1) Akrobatin (Acrobat) – If there is no king this round, take the crown. (x3) Kassenwagen (Ticket Booth) – Once per turn, the active player may place one gold on this card to draw two cards and keep one. You may trash this card to gain all gold on it. (x2) Lebende Kanonenkugel (Living Cannonball) – Replace one of your buildings with a more expensive one from your hand, paying the difference. (x3) Zirkuszelt (Circus Tent) – You may build this, which counts as a zero point building without color that the Warlord cannot destroy. Time's Up! Blue is a charades-based party game for teams of two or more players (and is best with teams of two). Before the game begins, each player looks at several cards featuring famous historical or fictional characters and chooses some of them. Each player's cards are shuffled to form a deck, and this deck is used for each of the game's three rounds. In each round, team members take turns trying to get their teammates to guess as many names as possible in 30 seconds. In round 1, almost any kind of clue is allowed, and the cluegiver cannot pass on a card. In round 2, no more than one word can be used in each clue (but unlimited sounds and gestures are permitted); the cluegiver can pass on any card he likes, and the teammates can give only a single answer. In round 3, the cluegiver can use no words at all and can pass as often as he likes; again, teammates are allowed only a single guess. Give good physical clues in round 1, and they'll pay dividends down the road when you need to keep your mouth shut and gesture like a maniac before time's up!